The seventeenth annual Toronto Bottle Show was a big success. The show is produced entirely by volunteers from the Four Seasons Bottle Collectors, one of Canada’s oldest and most respected clubs. Sunday April 17th 2011 was a gray day with periods of rain and huge flakes of snow, but the miserable day outside didn't spoil the mood at the bottle show, in the gymnasium at Humber College in Rexdale. Over thirty different dealers waited inside at 9:29 am as over 100 collectors and enthusiasts lined up outside waiting for admission. The ticket price was only $5, but there were no exceptions! Click the pictures below; they expand so you see all the juicy details. Dwight Fryer held up a triangular amber poison bottle with really pronounced horizontal ribs. It was German, a bottle produced for a wealthy chemist / druggist and the personal doctor to Ludwig III of Bavaria. The bottle had the word GIFT stamped in the glass midway down the panel. What was the GIFT? Poisonous lozenges! The bottle held disinfectant lozenges which could turn ordinary water into a disinfecting solution for surgical tools. These were called sublime pastels and the product was used before the 1900s. Dwight wanted $500 for the piece which he believed was quite rare. This collector specializes in poisons and so if he treasures a piece for its rarity than it must indeed be rare, or else he's an amazing salesman. I didn't spend $500, but I did buy a cobalt blue Teasdale chloradine and a coffin shaped carbolic acid bottle NOT TO BE TAKEN because I love them. Brett Bloxam had the best table of different coloured insulators, with his best being displayed on a white board. Some are threadless and most are just real hard to find he told me. He was asking $100 or $200 for the Hudson glass pieces. For Brett it’s all just a wonderful hobby and nothing more – he always does well in the exchange of ideas and hard currency at the bottle show and likes being in on the fun as one of the dealers. 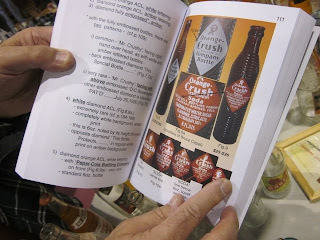 Michael Rosman holds up his book, 'Kinkly to Mae West' which encapsulates all his knowledge of orange crush collectibles. His Orange Crush t-shirt was visible from the door. He's a man that treasures uncommon isotopes of orange pop. Michael has studied and collected Crsuh for many years and now he's sharing his knowledge with other collectors. Michael Rosman has authored and sells a $40 print book. Good move. Its a fact that knowing the different bottles and their classifications is key to spotting and buying at good prices those precious rare variations. Michael also showed me the most current gem in his collection , which regrettably I didn’t get a picture of – it's a French language Orange Crush that was made for the Quebec market. A quiet Ron Hunsperger collects beers, but is changing his focus to collecting bottles local to Oakville, Hamilton, especially Burlington. While I waited Ron had another conversation about Stratford medicines and then when he came back to me we discussed his black glass 1880 O'Keefe beer bottle that’s a particular dark shade of green. It looks black. The dark glass may have contained a light sensitive specialty brew and that's one of the reasons he brought it to the show. Robert Lloyd had some insulators and bottles and he explained how these items reflected his own progression as a collector. His father was a cartridge collector and he would accompany his Dad to gun shows and didn’t have very much fun because he wasn’t allowed to touch things. So at a very young age he started collecting things he could handle, and that was insulators and bottles. In the center of his table he had a porcelain doll in fair condition,. He described it as a good fixer upper for a period doll collector and I laughed wondering how a doll could ever be considered such a thing. But the face is great and X overall in good shape. it has a porcelain head, neck and shoulders and leather body . It is however missing its porcelain hands and has suffered a few small puncture wounds – Robert recalled how he’d once seen a period advertisement of this doll in the same newspaper that reported the assassination of Thomas Darcy McGee April 7, 1868. Adam and James Jarzabek collect beverages and they both have a particular fondness for old milks and cream bottles. And milk caps and beer labels. And beer trays and old beer cans. Also present among their offerings were some rare sodas. I ask dealers to pick up a bottle for a picture and Adam selected a Tossells bottle from Niagara Falls Ontario. The bottle was embossed with plenty of writing including the words Lager and Gingerale. How could it be both? The bottle could hold either liquid – the company made both , which meant they could comfortably put either beverage in this vessel alongside a paper label identifying which one it was. 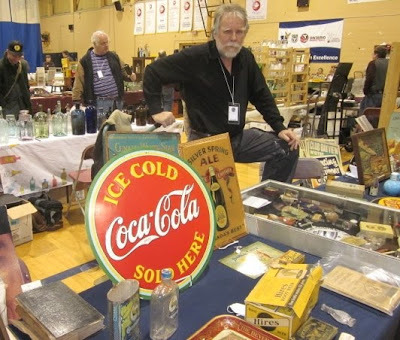 Ron DeMoor is one of my favourite dealers and talk with him every year at the bottle show. I find him very personable and quick to make a jokes and tell me something interesting – he’s well liked by the rest of the crowd too, and so its good to visit him a little later after everyone has said hello. That way you’re not constantly being interrupted by gentle banter – their three ways deals - and the connections people make after not seeing each other for a year. Ron and I talked about torpedo bottles and he posed with an English torpedo (and he revealed a secret to me…*) the bottle was embossed J.T. Shephard Co Geraldton Potass Water which is a form of soda beverage I concluded and didn’t ask any more ... I don’t think potass water would sell very well today hahah. I did ask how old it was, and Ron reckoned it was from the early 1880s but it could have been made earlier, as early as the 1860s. There are other specimens so it’s not 100% unique. *Ron revealed to me that in his experience, torpedo bottles manufactured in North America are more egg shaped and have rounder bottoms than the English variety torpedo bottle which are more conical, and more 'torpedo like' if you will. That’s a good tip and something I will investigate further. Have you got any one of a kind North American torpedo bottles? He reached for the R.A. Pilgrim torpedo. Is this rare? I asked. ‘There are three that we know of in Canada’, a nearby gentleman (pnjmarchand) volunteered the information that Robert Alfred Pilgrim of Hamilton was a merchant druggist / soda manufacturer and recent immigrant. So 'Pilgrim Bros' soda bottles are younger than R.A. Pilgrim, the father of the boys. So how much money would Ron take for the piece? Ron hummed and wheezed and finally said he would consider all offers over two thousand dollars for this rare bit of Canadian history. David Langford was selling many antiques, but very few bottles. Ed Locke had lots of neat stuff to show and sell and a marvelous attitude alongside. His table was one of busier booths and our talk was twice interrupted by commercial traffic. Ed likes old advertising and that includes tin signs, box art, metal panels and even good condition cardboard signage. He knows how much art decorators and interior designers love old signs - there will always be a demand for these antiques because they look good on basement walls and Canadian cottages. Ed has been collecting posters and old signs and other fascinating things ever since he started decorating his own house twenty five years ago. Ed showed me a rock that is Solnhofen Stone from Germany and used for lithographic printing. This sedimentary rock is a very fine-grained, compact limestone. It’s the finest grained limestone in the world, and that’s why its so sought after for making the negative hand carved etchings used in early lithographic printing. The uniquely fine granular qualities of Solnhofen Stone are remarkable because limestone is so prevalent on Earth. Yet Solnhofen Stone is only found in the Jura Mountains in Bavaria. Only this stone has the superfine quality necessary for lithographic printing. The curious piece gets more interesting when you ponder the rough hewn sides – how could a machine incorporate such an odd sized rock into any type of printing assembly? The printing rock has a lifespan. It is shaved down when a new advert is etched into the surface. So the rock lives on through many ads - one rock could be quite thin at the end of its life after having served up thousands of replications. Robin Newton Smith holds a tea kettle ink embossed on all six sides. The Joshua Jonson Japan Writing Fluid London tea kettle ink is worth about $150 bucks he reckons - its from the 1830s. The piece is newly acquired and currently the apple of his eye and the centerpiece of his table, which had some great cobalt blue bottles and bottle of unusual colour. Robin was saying on how he believes that cobalt disappeared from glass making because it was high demand for medicine. He postulates that the high price of cobalt element which is key to making blue glass, disappeared from glass making because of its rising price due to the popularity of the freshly discovered 'cobalt treatment' medical procedure. An interesting hypothesis. Robin collects early glass and not just early Canadian glass, but all sorts of early glass and not just bottles either. He once possessed Syrian glass which predated Christ, and he’s handled some Roman glass pieces too. Robin is the proprietor of NSA Auctions which is currently being retooled. He hopes to host another online antique glass auction in late 2011, and so we’ll all be watching for that. Chris (Newf) Welton is a true Canadian dumpdigger and one with whom I've pitched a few holes. I like Newf and so does everyone else in the scene - he's a straight shooter with a lot of Hart. The Toronto Bottle Show is always better with Newf and Malcolm together in their usual spot just inside the front door at the headland of the rows, if you know what I mean. There's no doubt its a position of honour; they earned that spot by always having the busiest table on the evening before the show. Remember, by and large, the set up on the Saturday night before the Sunday event is when the dealers buy from each other. At that time Chris Welton and Malcolm McCloud are by far the busiest vendors. As prolific dumpdiggers they're a perpetual source of fresh curiosities. Chris is a very charismatic digger and collector of early Canadian pottery and especially salt glazed stoneware. Always ready with a story Chris related to me on how he recently attended an estate auction in a small town about an hour north of Toronto, during of snowstorm. With only 25 other buyers in the room, and only one other known bottle collector the conditions were perfect for scoring some nice treasure cheap... for but nothing caught his fancy until he spied this jug. Over by the fireplace he spotted an ovoid jug well decorated with Hart Pottery distinctive figural design around the number 2 denoting its capacity in gallons. More than one hundred and fifty years ago this beautiful jug was once filled with whiskey or rum or whatever a merchant could sell. 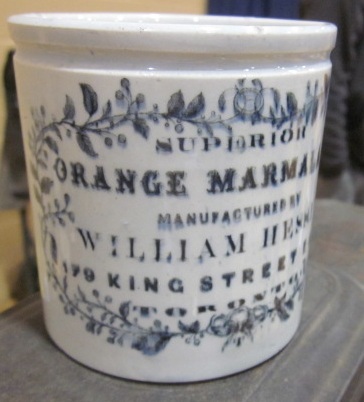 Here is a wonderful rare marmalade jar that belongs to Malcome McCloud, a veteran who digs in downtown Toronto and procured this relic from the earth last summer. The label reads 'Superior Orange Marmalade manufactured by William Hessin 179 King Street East'. These kinds of relics are terrific because they're really traceable - by using the 1800s business directories its possible to find the exact years that this merchant occupied that location and thereby date the artifact. Frederick Hartl makes the drive from Quebec every year, and usually brings a friend named Jean Marc who unfortunately could not attend this year because of Monday morning commitment at furniture school in Quebec City. When it came to pose for a picture Frederic picked up his H. CHRISTIN ginger beer. It was made by Brantford pottery and now has a marvelous crackled finish. Frederic is partial to this one. 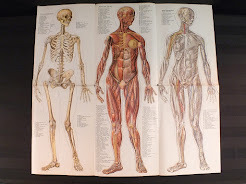 When he was just fifteen years old he started collecting the most commonly found old bottles and was giving himself an education by reading books. When he flipped to the section indexing the most valuable bottles in an early UNITS book he found this crown jewel held up as one of the most rare and vaunted of Canadian ceramic collectibles. At that time Frederic felt that he would probably never own such a precious thing, until last fall when he got an opportunity to buy one from a construction worker living in Ottawa. Frederic has his own website , french language Quebec bottles website. Terry Matz was full of surprises this year. 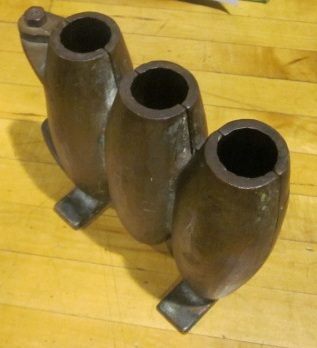 The Torpedo Bottle king of the fair specializes in all manner items relating to torpedo bottles including molds and pressure guages. He has a lot of coloured glass on his table, pontiled glass and early stoneware and other Canada West trade merchandise. Terry Matz is the club's resident bottle tumbler and he charges $20 a bottle no matter how dirty or how valuable. Any glass vessel can be made clean(er) by 'tumbling it' - someday I will detail this science / art form on this blog, but not today. Jamie McDougal is an extremely knowledgeable individual and 'book smart' collector that hunts and gathers really old antiquities all the way back to arrowheads and flint tools. His table is always a hodgepodge of really sensational stuff. Jamie posed for my camera with a bottle that was embossed, ELEPIZONE certain cure for fits epilepsy H.C. Root MC Toronto ONT. The bottle has a slight sun cast amethyst colour which Jamie was quick to remind me meant the bottle was made before World War One when manganese became rather difficult to procure in North America. Mark Wilson lamented that he had a quiet year and didn’t do any digging and only a little diving. He’s been passing the time buying and selling and doing a lot of reading online, streamlining his Peterborough area collection. Mark collects crocks and bottles from Peterbourogh and the Kawarthas. He had a David Knox gravitating stopper on the table for sale – its from Campbellford, and that’s too far away, on the other side of Rice lake and down the Trent River a stretch..
At the end of his table, and the property of another vendor on Mark's dive team were miniature wooden paddles that were selling for $50. This is cottage kitsch that was made to promote a vacation destination. Sometimes by these items were made by indigenous peoples and are labeled 'native crafts'. More sophisticated goods was imported by a tourism board, or a travel association that profited by the trade. These items were not created as advertising per say, but rather they were small knickknacks, or mementos that could be purchased in hotel gift shops and in restaurants and thrift stores in the small towns. They would be taken back to the cottage and mounted on the wall, or taken home and put in the living rooms of houses to remind the family of their cottage and their annual summer fun. Priced attractively at $50 a pair, or $100 for the Algonquin park piece, these would look great in a certain Muskoka cottage located fifteen minutes west of Bracebridge, on the sunny shores of Lake Muskoka. Abel DaSilva and his wife June Ng had a mountain of stoneware that occupied every square inch of available table space. As usual, Abel did more talking and walking and orbiting the booth, while June remained behind the counter and handled all commercial transactions. Together they're quite a team and on this particular Sunday they did a lot of business. Abel showed me some handsome pottery from a merchant named James Burns who was a wealthy grocer and spirits dealer in the 1840s St Lawrence Market in Toronto. I was also attracted to Abel's large collection of whiskey water jugs that were the foremost row of his grand assembly. These were painted with faces and logos and cartoon characters and fashioned as barroom advertising for famous whiskey brands. Abel explained that whiskey and water was always a popular drink and these tiny pint sized pitchers held ice and water for bar patrons. 'They added some class to the joint you know' he said they were popular in America as early as 1910, and the trend emerged here in Canada after World War I, and lasted throughout the 1920s and 1930s. Today they range in price from $300 to $500 - the pieces sell well in online auctions. These two bring their own personal style to the Toronto Bottle Show and in many ways they put themselves on display right alongside their uber brewerania. They are however extremely friendly. Laura likes rock and roll and is particularly fond of Joe Satriani. On their table rested one of the most talked about pieces of the 2011 bottle show. A Dutch onion wine bottle from 1735 with its original contents. This fantastic museum grade antique is older than Canada and was the oldest bottle on display at the show. Recovered from the wreck of the T’Vliegenthart which was a 145 ft long barge. The Flying Hart left the Netherlands on her doomed course for the East Indies on February 3rd 1735 with 167 seamen, 83 soldiers, and 6 passengers. She was loaded with a large amount of gold and silver coins intended for trading for precious stones, spices and silks at the destination. The Flying Hart however never made it out of Dutch waters. It was shipwrecked, driven onto a sand bar by strong winds, she sustained severe damage causing her total loss. There were no recorded survivors. The wreck was recently found intact and the insides of the ship were examined and showed how the onion bottles were stored for transport in early Imperial Age Dutch merchant marine ships. As I mentioned before, Pete's bottle still has its original contents. Pete told me that if they were to open the container they would have to drink the liquid very quickly, and that if you went back for second glass it would taste different, more acidic and the liquid would very rapidly oxidize and become an entirely different flavor. The quality of the wine found in centuries old containers is drinkable, but Pete explained to me how quality of the wine or spirits depends on a great many factors. If bacteria get in, it's vinegar. If dry air caused the cork to shrivel and let oxygen into the vessel, the spirits are dead. If it was stored in too hot or too cold conditions, it's dead. And if it's been exposed to long periods of bright light, it's dead. If it's a wine that was never meant to be aged, then, well, it's not gonna be much good at all.